The president also accused The New York Times of "treason" for recently publishing an opinion piece by an unnamed administration official. BILLINGS, Mont. 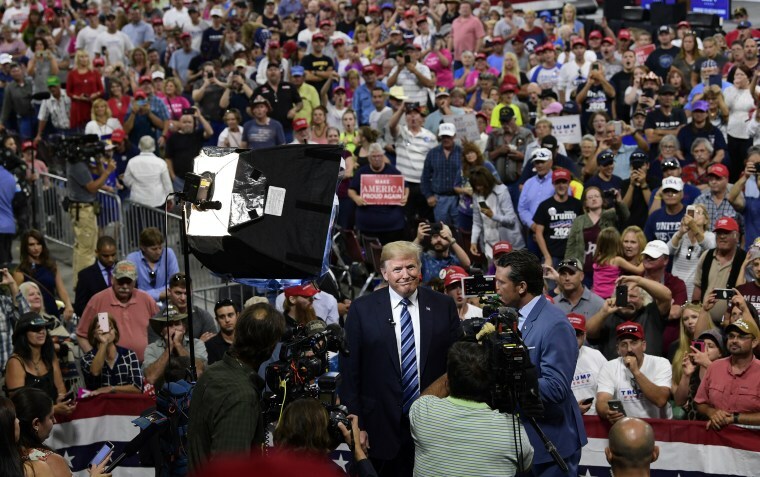 — Republicans have to show up to the polls to protect him from impeachment, President Donald Trump suggested at a rally here Thursday night. "This election, you aren't just voting for a candidate, you are voting for which party controls Congress," he said just before bringing up what he called "the impeachment word." Then, with the crowd at the Rimrock Auto Arena here rapt, he went on an extended riff on calls for his impeachment and removal from office. He said Democrats want to get rid of him regardless of whether he's done anything to merit that sanction. "It doesn’t matter, you will impeach him!" Trump exclaimed, impersonating Rep. Maxine Waters, D-Calif. "I say how do you impeach someone who is doing a great job that hasn’t done anything wrong." Trump was in Montana — for the second time since July 4 — to campaign for Matt Rosendale, the Republican nominee against Democratic Sen. Jon Tester. Tester, who has led by single digits in the scant public polling so far, is a top target for Trump because of his leading role in knee-capping Trump's nomination of Rear Adm. Ronny Jackson to be Veterans Affairs secretary. Tester was scheduled to air an ad Thursday that points to the times he and Trump have been on the same page, but he also sent out a fundraising appeal through the Democratic National Committee asking for $10 donations to "help me fight back against Trump's relentless attacks" and "send a powerful message to Trump that we won't give up this Senate seat without a fight." At the rally, Trump knocked Tester for the Jackson nomination fight, for voting against Supreme Court Justice Neil Gorsuch and for voting against Trump's signature tax cut. "What Tester did to Adm. Jackson should never be allowed," he said. "Ronny Jackson is a great man." The president appeared to be in a particularly bellicose mood Thursday, describing Democrats as "left-wing haters, angry mobs, deep-state radicals." In an interview with Fox News conducted in the arena before his speech, Trump accused The New York Times of "virtually" committing "treason" by publishing an opinion piece in which a senior administration official anonymously wrote that many of Trump's aides are "working diligently from within to frustrate parts of his agenda and his worst inclinations." In the interview with "Fox and Friends," which aired Friday morning, the president blamed the paper. "No. 1, The Times should never have done that," he said. "What they've done, virtually it's treason." Treason, as defined by the Constitution, involves waging war against the United States or providing aid and comfort to its enemies. Trump, whom aides and allies have described as "volcanic" in the hours after publication of the op-ed, was clearly still frustrated on Thursday. The anonymous opinion piece is different from books the White House has tried to fight back against, including those by Bob Woodward and Omarosa Manigault-Newman, because there's no one to attack personally. "When somebody writes and you can't discredit because you have no idea who they are," he said. "It may not be a Republican, it may not be a conservative, it may be a deep state person that's been there a long time." Moreover, he said, "it's a very unfair thing" to "our country and to the millions of people who voted really for us." During his speech, he called the unnamed writer "an anonymous gutless coward." But the thrust of Trump's remarks was aimed at hammering Democrats, at times without regard for the truth. For example, he accused them of wanting to harm the Social Security and Medicare programs that presidents of their party created and which they have defended against Republican efforts to cut. "They’re going to take away, they’re going to hurt your Social Security ... and they’re killing you on Medicare," Trump said. "On top of that, you’re going to pay more taxes. It’s crazy." It would be unusual for a party to call both for cuts to entitlements and tax increases at the same time, and Trump's argument conflates the positions of the two parties in Congress. Republicans on Capitol Hill have historically, and recently, tried to slash funding for entitlements, including Medicare and Medicaid. Trump said on the campaign trail in 2016 that he would defend Medicare and Social Security and reiterated that Thursday. "I’m going to protect your Social Security," he said. "Matt Rosendale is going to make sure we’re not touching your Social Security, and your Medicare is only going one way — that’s much stronger."